Sunflowers Van Gogh research papers examine flower paintings by one of the greatest painters in history. Many regard Vincent Van Gogh as one of the greatest painters in history. During his lifetime, he only sold a single painting. Since his untimely death in 1890, his work has become universally admired and iconic. Among his works are two series of paintings of sunflowers. Between 1886 and 1888, Van Gogh lived in Paris with his brother Theo. It was during this period when he executed the first of his sunflowers series. 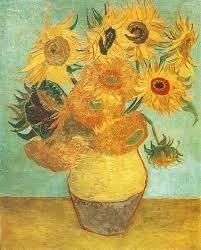 Four painting from August 1888 depict sunflowers in a vase. The first has three sunflowers in a green vase with a turquoise background. It is currently held in private hands. The second version had a royal blue background. This was held by a private collector in Japan and destroyed during World War II. The third version, with a blue green background in on display in Munich, while the four, which greatly resembles the third, has a yellow background. This is perhaps the most famous of his sunflower series, and the one most people see, as it is frequently reproduced. It is on display at the National Gallery in London. In January 1889, Van Gogh made three repetitions of the third and fourth versions of Sunflowers. One can be seen at the Philadelphia Museum of Art, one at the Van Gogh Museum in Amsterdam, and the third at the Sompo Japan Museum of Art in Tokyo. Along with Starry Night, Sunflowers remains Van Gogh’s most iconic work. Expressionism Art research papers look into the art movement that started in Germany that presented images in a distorted and subjective perspective. Expressionists had a colorful art style that showed characteristics of other painter's styles, such as Vincent van Gogh. Paper Masters writes custom research papers on Sunflowers Van Gogh and examine flower paintings by one of the greatest painters in history.